Phonathon 2017: You helped us raise more than $187,000! Thanks to you, our generous Wayne State alumni and friends, the Wayne State Foundation has raised more than $187,000 in gifts and pledges through our annual Phonathon fundraising campaign! Our 54 WSC student callers and four student managers enjoyed calling you earlier this year to update your information, share exciting progress happening at Wayne State, and ask you to consider making a gift to support the efforts of Wayne State College. Many of you responded with positive feedback, and we thank you for your support. Our students enjoy hearing from alumni, with their stories and memories of attending WSC. When we launch our next calling campaign, we encourage you to get to know your student caller and share your advice and experiences as a WSC alumnus. Phonathon 2018 will launch in November 2017 with a letter to past donors sharing the exciting advancements happening at Wayne State and stating our goals for the academic year. Following the letter, Phonathon calling will begin in January 2018. You will have the opportunity to show your support for Wayne State by making a donation through the letter or in response to the call. If you have not been receiving phone calls, please be sure to update your information at www.wsc.edu/alumni. Percentage of Alumni Giving: Your support makes a difference! The national average for alumni giving to their alma maters is 7 percent. Our Wayne State alumni give back at a reported rate of 10.1 percent. In so many ways, WSC alumni exceed expectations. Wayne State’s percentage of alumni giving (also known as alumni participation rate) is a number the Wayne State Foundation can boast when reaching out to other foundations, businesses, and organizations for financial support. It’s evident to them that alumni believe in the mission of Wayne State College. You truly make a difference. No matter the size of the gift, your individual support is reflected in our proud 10.1 percent, and you can help that number grow. Let’s make it rise in 2018.
International Giving Tuesday: Join us for the first time ever Nov. 28, 2017! Giving Tuesday (#GivingTuesday) is an international day of giving and falls on the Tuesday after Thanksgiving. We’re familiar with the shopping sensations of Black Friday and Cyber Monday, and now you can also show your philanthropic side by joining us on this day! For the first time, Wayne State will be participating in the online giving campaign Nov. 28 through our website, social media, and e-newsletter. Stay tuned for details on this unique giving opportunity, and please join us in giving back to your alma mater on this special international day of philanthropy. Phonathon is an annual program under the direction of the Wayne State Foundation. We hire approximately 50 students and train them to call alumni, parents, and friends of the college in order to update address and employment data, build relationships, and raise money for Wayne State College. Phonathon starts in January and runs through the first week in March. 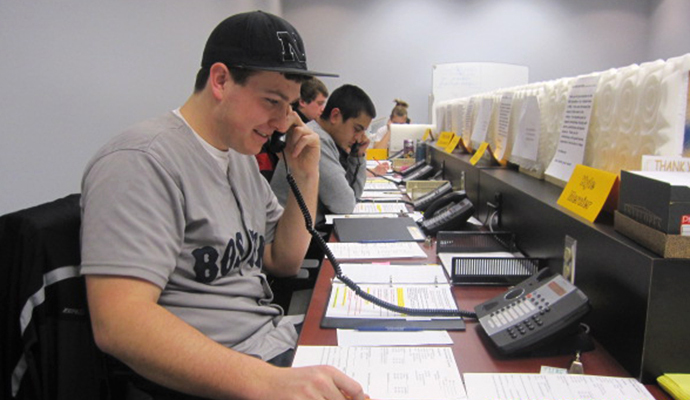 Why do students work for Phonathon? Because they care about WSC and realize how important the Phonathon funds are to maintaining the strength of the college. The money raised during Phonathon is spent on things important to the students - scholarships, faculty/staff grants, and special campus projects (Carhart Science renovation, Campus Commons, the Turf, Track and Soccer project, and the Willow Bow, to name a few) in addition to publications and operating funds. Working the Phonathon gives students the opportunity to know they are making a difference and earn some money for college. It also allows them to talk with WSC alumni giving them the chance to learn about our school’s past and maybe even network their way into an internship or job after graduation. Phonathon is successful! In 2017, alums and friends of WSC gave more than $187,000 through Phonathon. In 2016-17, the Foundation, with the help of the Phonathon, was able to distribute $4.6 million to the college. Why do people give to Phonathon? Alumni, parents, and friends of WSC donate to help current students because they believe in our mission, they want to give back to the institution that helped them achieve success, and they know they will be improving the quality of student life by helping to provide scholarships, equipment, and extra-curricular activities. Do telemarketing laws apply to Phonathon? No. WSC is exempt from the do-not-call registry because the federal government realizes private giving is essential for campuses to cover unmet tuition costs and other enhancements. If you did not receive a call from a student but would like to contribute to the Phonathon, you can make a gift online. If you have any questions about Phonathon, please call Laura Robinett, Director of Alumni Relations, at 402-375-7370. Gifts and donations are gladly welcome to help the Wayne State Foundation continue their support. With this secure online form, you can easily make a gift to the college.